Crawley Town have placed chief scout Martin Hinshelwood and striker Gary Alexander in interim charge. The West Sussex club sacked manager Richie Barker on Wednesday evening following a seven-match winless streak in League One. The Reds terminated the contract of assistant manager Anthony Williams on Thursday morning. Hinshelwood joined Crawley as a scout in summer 2012 after spending 14 years as head of youth football at Brighton. The 60-year-old, who was assistant manager of the Seagulls from 1987 to 1994, had a short spell as first-team manager of Brighton in 2002 and was caretaker boss twice. Alexander, 34, joined Crawley in March 2012, initially on loan. He has made 18 appearances this season, scoring three goals. 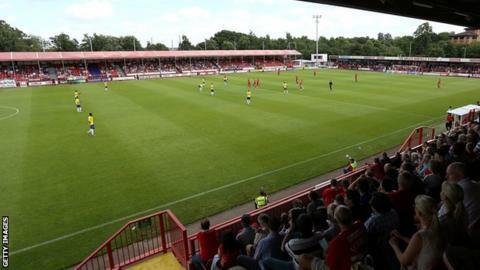 Barker had been in charge at the Broadfield Stadium since August 2012 and led Crawley to 10th place in League One last season. The 38-year-old former Bury boss parted company with the club following a goal drought which had seen the side score just once in seven league games. Crawley chief executive Michael Dunford described Barker and Williams as "really good people" but that their desire to continue progressing was behind the club's decision to part company with the duo. "We happen to think it is in the best interests of the football club and that is all that matters really," Dunford told BBC Sussex. "They have done an excellent job for us but it was felt a change was required. "If you don't make decisions then you are never going to progress. There is still a burning ambition within the boardroom to see this club go forward." Dunford added there is no set timeframe for the appointment of a new manager. "We want is right for this club," he said. "We are not going to be rushed into any decision. "We have every confidence in Gary and Martin holding the reins and the club is in very capable hands." Hinshelwood, who was due to be scouting Bristol Rovers on Saturday, will now take joint charge at Crewe. "I had a few spells in charge at Brighton over the years and I enjoy it," he said. "I am unbeaten as a caretaker. "I've known Richie a long time, worked more with him this year and I'm disappointed at his dismissal but life goes on. "We've had seven games without a win but we haven't played that badly. "I've worked with the players every day this year and we need to liven up a little bit and be positive with what we do."